Outlast Q8 Log Oil made by CTA Products Group is a non-drying oil based product that moisturizes exterior wood surfaces leaving a natural look for those who prefer not to have a film forming finish on their log homes, log cabins or cedar or redwood siding. It’s composition does not encourage mildew growth and it does not need to be stripped in order to apply a maintenance coat. It’s a non-drying oil, which means that each time you clean it you will need to have the product reapplied. Because it is classified as a non-drying oil, it will not form a film that can crack, chip, or peel. The oils penetrate into the wood and will fade over time, if the product is not maintained. 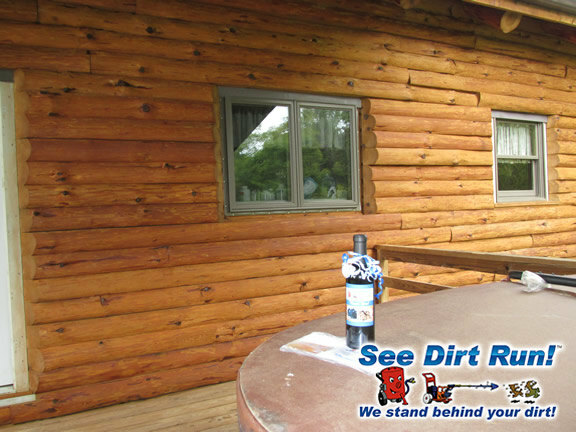 Only tinted sealers like Q8 log oil (containing pigment that gives them color) offer UV protection for your wood. Appalachian Log Homes recommends CTA Products Q8 Log Oil on their log homes. For this reason we only suggest using tinted sealers or solid stains for your exterior wood. Clear sealers (water clear) are not recommended, and will not offer you the level of protection found in tinted sealers and solid stains. Color may vary depending on age, species and porosity of wood. 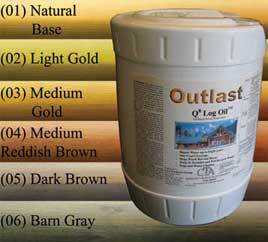 Outlast Q8 Log Oil is suitable for both log homes and wood siding. Visit our photo and video gallery to view photos of this product installed on various wood projects. This product works well on log homes, cedar sided homes, redwood homes, deck, fences, and other exterior wood surfaces. The product is available in a variety of colors, like Natural Base, Light Gold, Medium Gold, Medium Reddish Brown, and Dark Brown.